Depending on where it's heard and, who is telling the tale. Several sources were checked in researching this one and, there are many different variations. One thing for certain is, they are all, talking about this rock formation. Traveling north on HWY 58, this outcropping may be seen with Kouri-jima in the background. 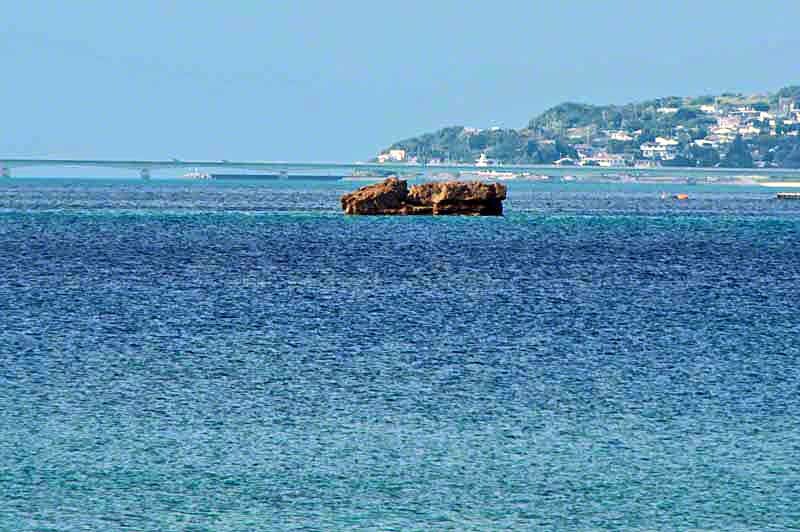 It is too far from the shores of this island or Kouri island, for the average person, to swim. Back in the days of the Ryukyu Dynasty, marriages were often arranged by parents. If, things didn't seem to be working out, between the couple, something drastic, had to be done. The parents would hold, sort of a council and, try to get the wedded couple agreeing. Whenever the stubborn rascals, couldn't see eye to eye, mom and pop, had a solution. Daughter would go in her family boat and, the son would, ride with his family. The group paddled their sabani boats out to Divorce Rock for a meeting. At low tide, there's a nice little cove of a beach with a shaded area in the rocks nearby. It's a great place, to picnic, negotiate peace and maybe, drink some spirits. If the couple, hasn't resolved differences, by the end of the day, they get left behind. The extended families, take the sabani boats and, row back to Okinawa. Pretty soon the sun goes down, tide rises and the chilly ocean breeze starts blowing, out there. The couple starts shaking and feeling miserable because, i Phones weren't invented yet. They only way to get warm, seems to be, hug each other and get that good feeling. When mothers and fathers, came back, to check on the couple, they were lovers, again. And, if they hadn't solved their marital issues, they would get to spend another evening, free. He gives you the Okinawan dialect "Wutu Fui Ishi" name for this Rejected Husband Rock. And, don't pass up, reading his text, along with the interesting comments. There's an Ugly Guy and Pretty Girl rendition of the tale. Gives a list containing nine resources, used in researching this story. They range from wealthy man, ugly man, ugly girl, to unhappy couple and everything between. The link comes from Google Translate and, possibly may be switched back to Japanese.